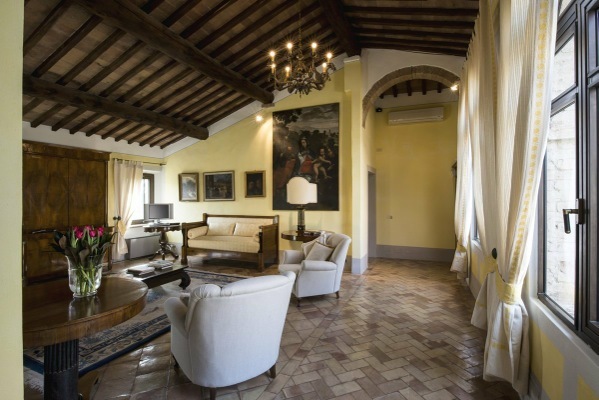 My good friend Ennio Polito, a renowned ophthalmologist by trade and natural entrepreneur, suggested one evening several years ago that I market his villa, Giuncheto, to my wine clients. 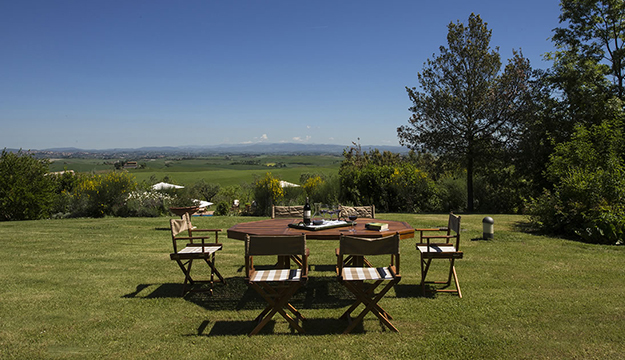 With his urging and support, my business organically evolved from a service for wine enthusiasts into a boutique Tuscan villa rental agency offering 29 homes with concierge service, especially tailored for wine and food lovers. While my entrepreneurial efforts are now focused on creating a new paradigm in wine retail, my love for Tuscany, and my home away from home, Giuncheto, will always remain. 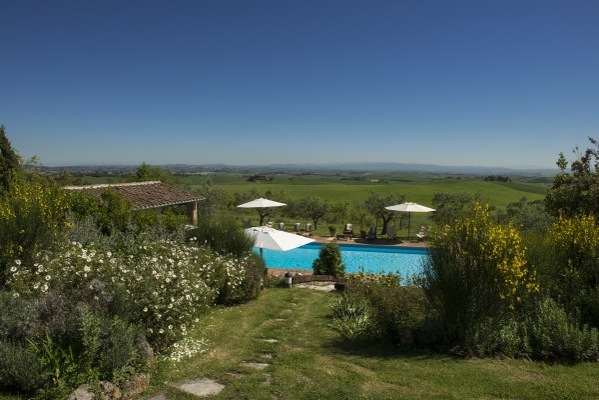 Much of my affinity for the region is the result of my experiences at this very special villa. 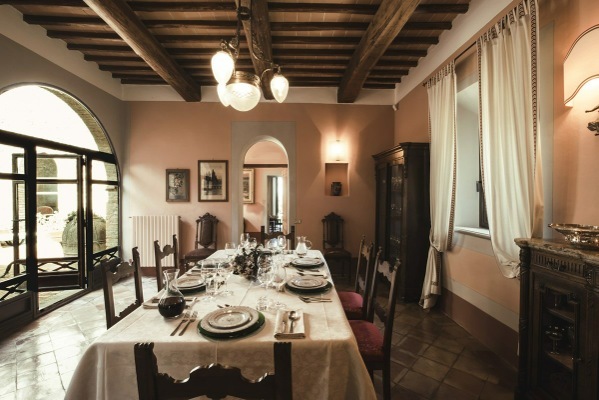 An unforgettable spot where my family and I have created lifelong memories, Villa Giuncheto is the perfect home base for wine and food lovers to create memories of their own. AC, and Hastens Mattresses in all bedrooms. 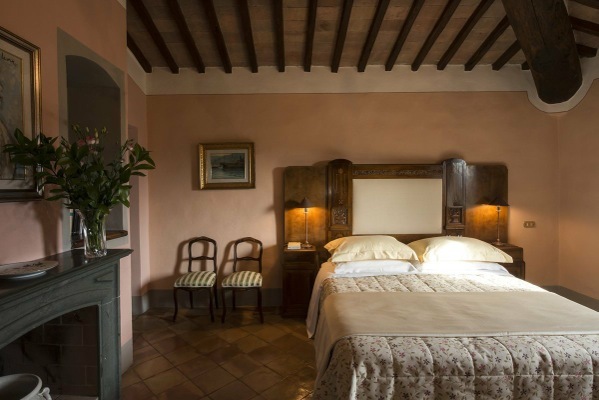 Originally a thirteenth-century monastery, Villa Giuncheto is part of a 95 acre estate. 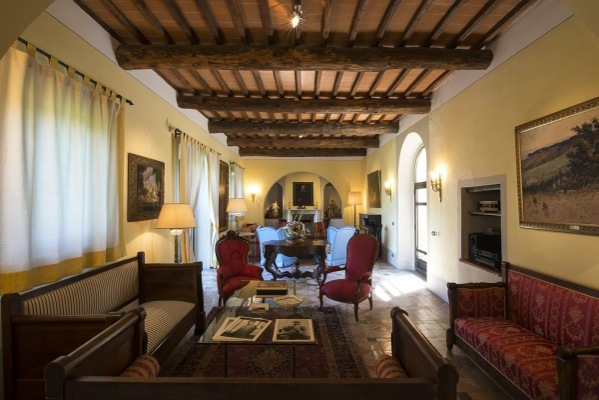 The family that owns Villa Giuncheto retained as much of the original structure as possible during its renovation. 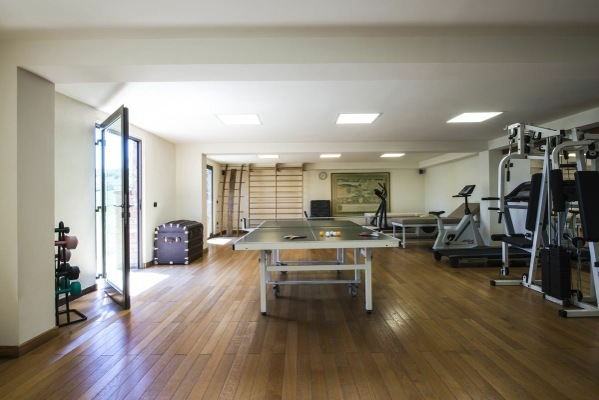 They restored the large wood beam ceilings, and added handmade tile floors, large full-pane windows, as well as modern amenities, including a pool, gym, tennis court, soccer field, and boccie court. The building’s original structure is that of a square built around an original enclosed courtyard. The villa’s design allows more sunlight, as well as cross ventilation. 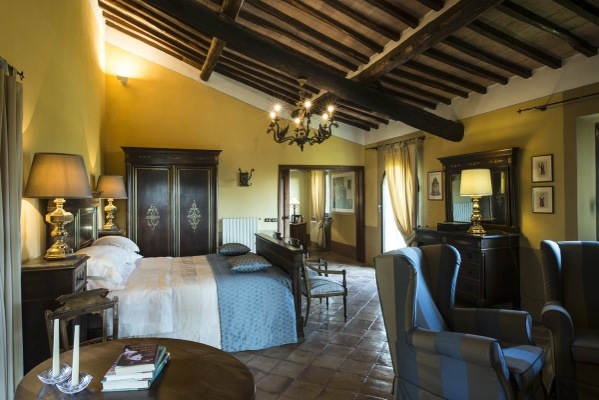 All of the bedroom windows face out to the gorgeous view surrounding the villa, including a stunning view of the countryside and a panoramic view of Siena. 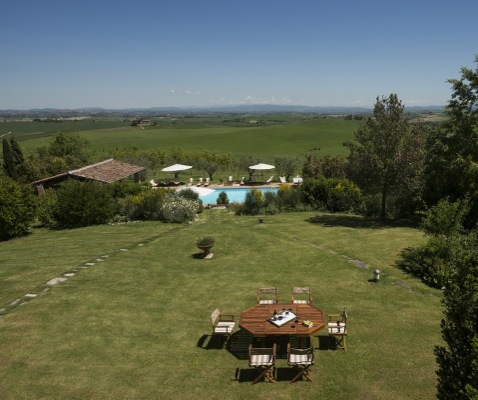 The property is secluded, however; the private driveway is only 15 minutes from the town of Siena and the superstrada from Florence. 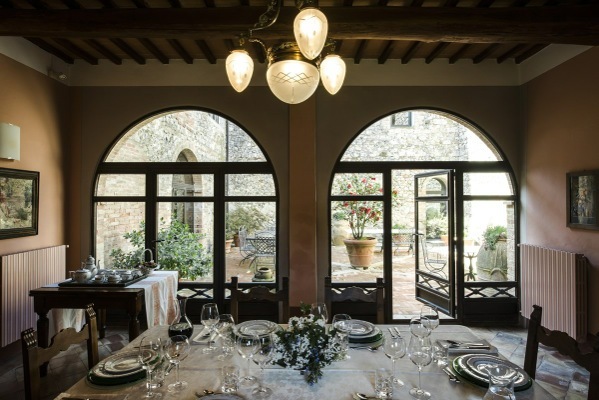 For wine and history lovers, Villa Giuncheto is in the perfect position for visiting Chianti and the medieval hilltop towns of Montalcino and Montepulciano. A long, recently constructed stone driveway emerges from the woods, up an incline surrounded by olive groves, passing the tennis court, soccer field, and gym before arriving at the villa positioned at the top of the hill. After numerous visits to Giuncheto, the view never loses its magic. 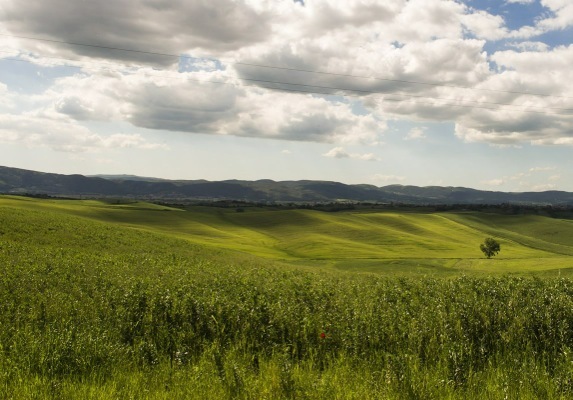 The rolling hills of farro (wheat), shifting light, and the especially captivating view of Siena in the distance provide endless colors and textures for the eye. 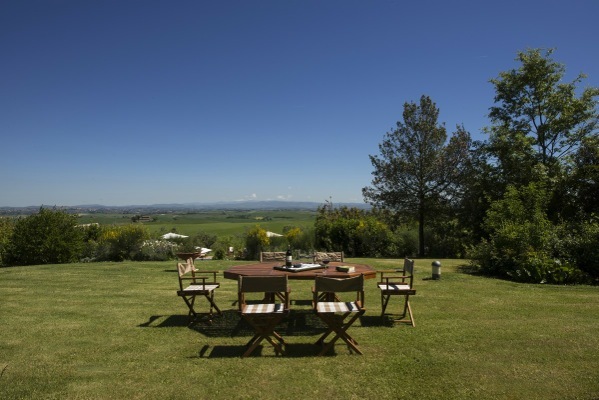 The villa is on one hectare of manicured grounds; the rest constitutes woods and olive groves. A stone terrace and manicured lawn and garden surround the house. Large terra-cotta pots are filled with hydrangea, geraniums, and lemon trees, as well as lavender and roses among other flowering shrubs in the surrounding gardens. On both the east and western terraces are lovely areas for lunch under umbrella-shaded dining areas. The lawn extends further on the back of the house, where a stone pathway leads you down to the pool (15 x 7) and gazebo. The brick terrace surrounding the pool is completed with wood chaises, chairs, and a hammock. The adjoining gazebo is equipped with a grill, small fridge, sink, sublevel bathroom/shower, as well as a stereo system (CD/Tape) with ceiling-mounted speakers for the pool area. 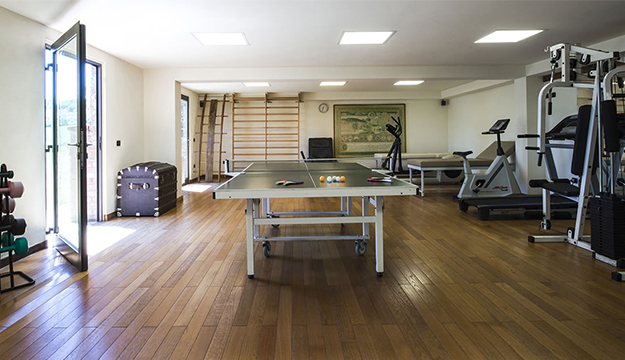 There is a synthetic tennis court, and large gym with Life Fitness equipment and a sauna. 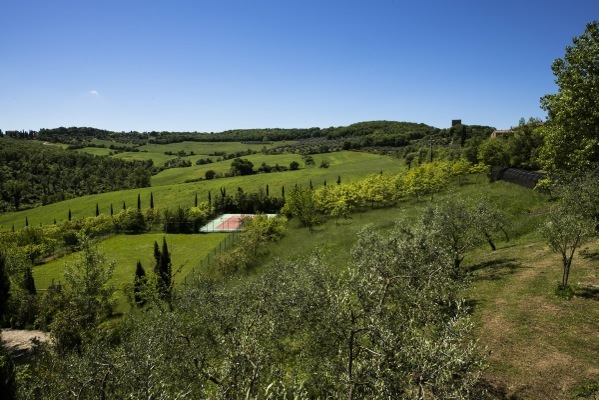 Much of the food eaten at Giuncheto comes from the land, including olive oil, eggs, fruit, and other goodies. 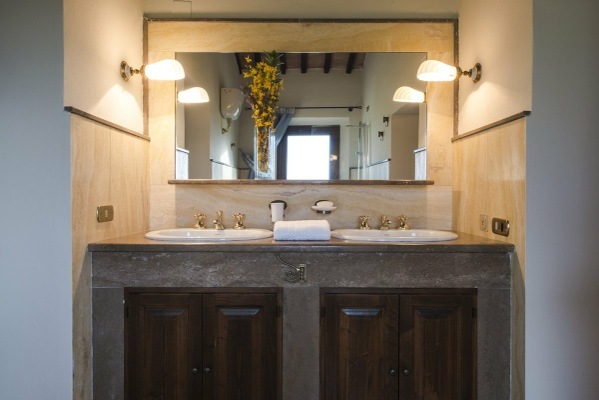 The guest house has two en suite bedrooms, with private kitchen and terrace. 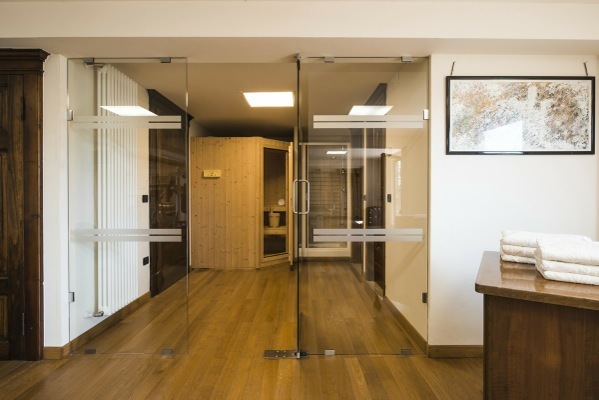 The main entrance has large wooden doors that open in to a large corridor with a vaulted ceiling. The staff’s quarters are off to the side, as well as the cantina (wine cellar). The corridor leads directly to the courtyard, which is adorned with hydrangea and azalea bushes. Large arched entrances with glass doors are positioned on all four sides of the courtyard. The courtyard, which can be lit at night, is perfect for evening dining, with glass tables that can accommodate a full house of guests. 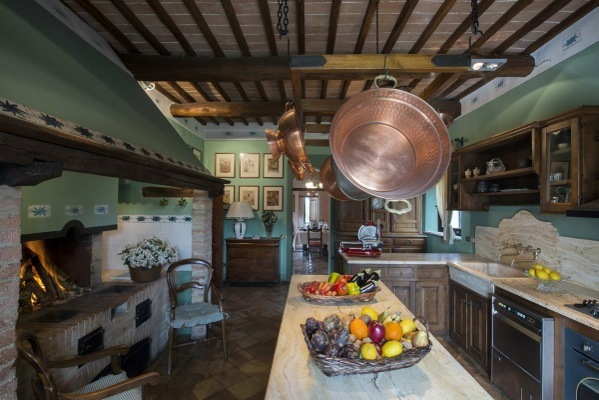 The Tuscan-style kitchen has all modern amenities (gas stove with four burners, oven, large refrigerator, food processor, dishwasher), as well as the original brick oven and cooking fireplace. 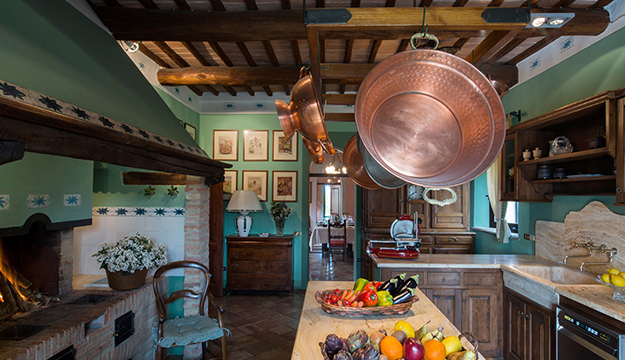 Copper pots hang above the island, with counters made of marble and hand-painted tiles that decorate the top of the walls. A glass door provides an additional entrance to the front of the house and the side terrace. 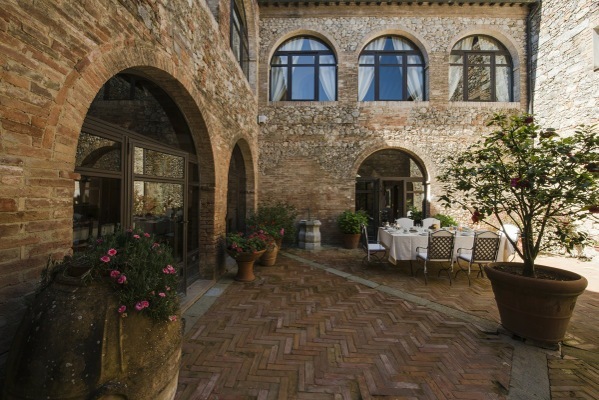 The dining room, which is next to the kitchen, also provides an entrance to the courtyard. The large wood dining table comfortably fits 12, with an antique sideboard for serving cocktails. The dining area also has a stereo (CD/Tape Player). The vestibule in between the dining room and living room provides an additional entrance to the courtyard, as well as including a marble-finished guest bath. The long, spacious living room has two sitting areas, with large sofa and chairs, full-size antique European billiard table, and embellished with antiques and oil paintings. 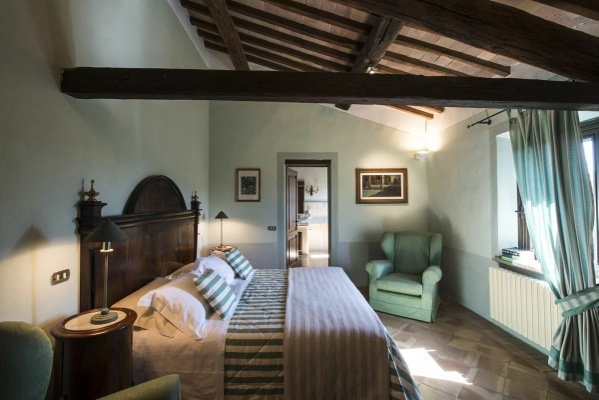 The floor features an attractive pattern of ceramic and marble tile, while the restored wood beams on the ceiling imbue a rustic feeling, whose warm colors add to the ambiance as well. Three sets of glass doors open to the back of the house, and there is an additional entry to the courtyard as well. 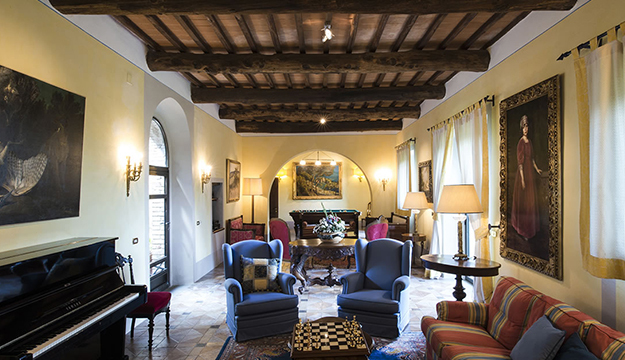 A family room with an entrance to the courtyard and side terrace is equipped with a flat-screen TV (European cable channels) and DVD player (PAL, European System). A vestibule next to the den provides access to the laundry room (for staff use), as well as a staircase to the primo piano (first floor). A large stone stairway opens up to the winter living room that has spacious sitting area, with a large fireplace, and antique day bed. 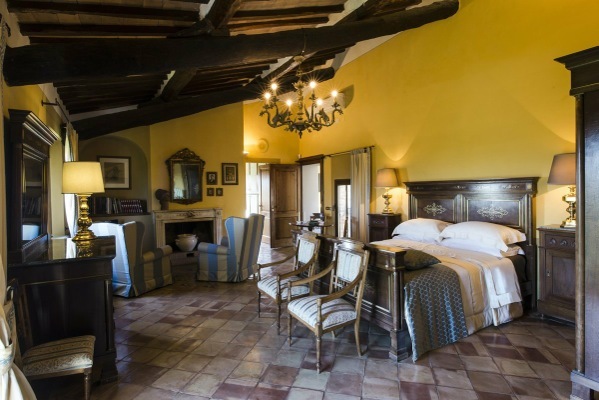 All bedrooms have air-conditioning and Hastens mattresses, often referred to as the maker of some of the finest mattresses in the world. A double bedroom features an east-facing window, brass bed (King), armoire, dresser, and antique day bed for lounging, reading, or enjoying the fireplace during the cooler months of the year. 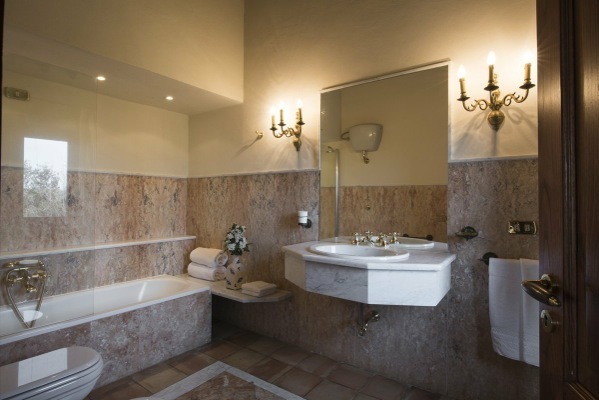 The bedroom has a private bath (tub with hand-held shower, no curtain) finished in marble and includes another east-facing window. Adorned with watercolors and prints, a larger bedroom in green tones is cool and comfortable with another window facing east, antique armoire, and desk complementing the bed (King). A spacious private bathroom (with shower), includes another east-facing window and marble-finished counters. 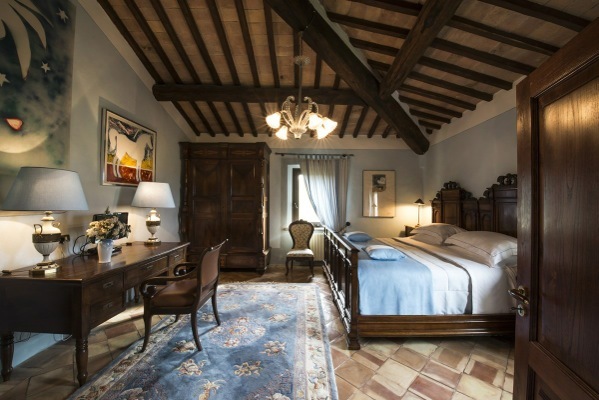 The master bedroom (King) features an antique king-sized bed, armoire, and dresser, with a TV (international CNN available) and sitting area, as well as a fireplace. 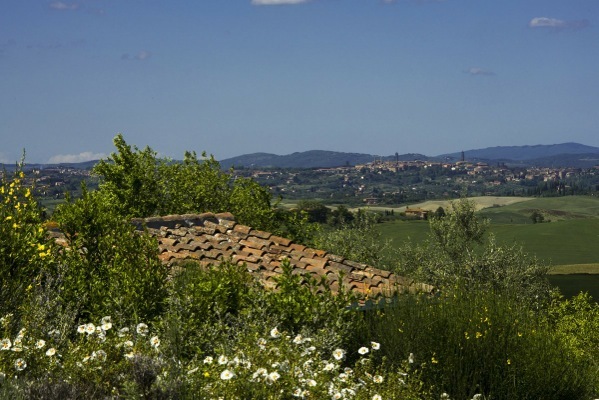 Its two windows face north to the beautiful view of Siena. A separate studio with desk and Bose stereo system also provides an alternate entrance to the master suite. 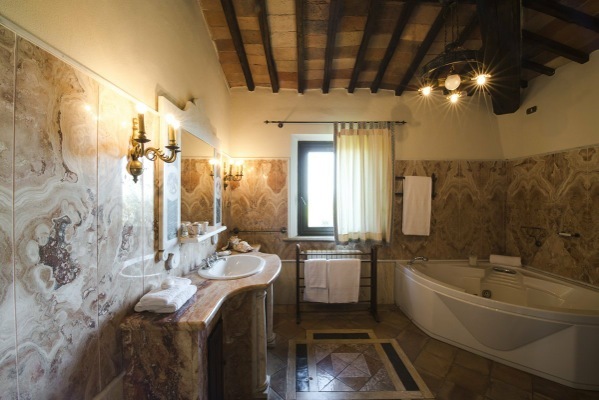 A very large marble bathroom includes a whirlpool tub and another window overlooking the view of Siena. There is a smaller bedroom with a Queen-sized bed and antique bedroom furniture, including dressing table, dresser, and armoire. Its window also faces north with a view of Siena. The bathroom (tub with hand-held shower, no curtain) has a window that faces west and is shared with the following bedroom. Another charming, bright bedroom with a Queen-sized bed, antique dressing table and side chairs provides the perfect spot to view the sunset from its window. A cool blue bedroom with a King-sized bed and west-facing window has a bathroom (tub with hand-held shower, no curtain) with double sinks, marble counters, and a large window, which is shared with an adjacent double. 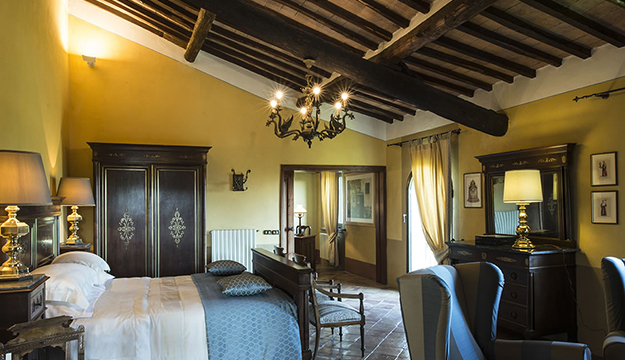 This elegant double bedroom (King) features an antique wooden bed, armoire, and desk. South and west windows provide wonderful light, as well as excellent ventilation. The room is also equipped with a TV that receives the main Italian stations. Fax machine, satellite TV, and computer with WiFi in winter living room. Cleaning: 4 hrs/day, 6 days/week. Sundays are extra. Pre-arrival shopping (excluding cost of groceries). Extra Costs: security deposit ($4,000), heat, electricity (AC), telephone/fax, extra cleaning (10 Euros/hour), continental breakfast (10 Euro per hour), lunch (20 Euro per hour), and dinner (35 Euro per hour). Extra cleaning is 19 Euro per hour (upon request). Caretaker lives in small cottage in the front of the house, while the live-in house keeper/cook lives in a suite on the ground floor. How did you hear about Jamesfantaci.com or Giuncheto? 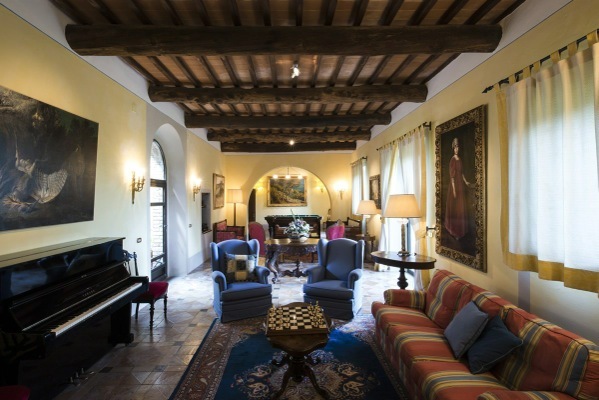 Villa Giuncheto dates back to 1348. Many of the original details still evident, including a courtyard that used to hold animals to protect them from predators. Now, the perfect spot for dining al fresco!